Guardians of the Galaxy #4 - Written by Donny Cates. Art by Geoff Shaw. Cover by David Marquez. Asgardian Variant Cover by Ryan Benjamin. The Dark Guardians, a new cosmic hit squad made up of the most powerful and cunning people in space, are going to kill Gamora. It's time for the new Guardians of the Galaxy to saddle up! Black Order: The Warmasters of Thanos TPB - Written by Derek Landy. Art by Philip Tan. Cover by Philip Tan. They are the scourge of the Avengers, the Cull Obsidian - Thanos' most feared warriors! Now the ruthless Black Order has been dispatched by the Grandmaster to destabilize a burgeoning empire - but as big and as bad as they are, there is always someone bigger and badder. Isn't that always the way? You go to assassinate an emperor, he turns the tables, and suddenly a very simple mission gets a whole lot more complicated - and the man called Nova shows up to spoil all the fun! As the Black Order suffers a painful and unexpected defeat, their new teammate the Black Swan is presented with a simple choice: stay and risk an ungainly end - or leave and abandon the closest thing she has to a family. Empires, rebellions, spies and sabotage combine in an absolutely unhinged adventure! Champions #5 - Written by Jim Zub. Art by Steven Cummings. Cover by Kim Jacinto. Marvel Battle Lines Variant Cover by Maxx Lim. WAR OF THE REALMS TIE-IN! The War of the Realms rages across Midgard, bringing together heroes from across the globe to fight for our world against mythic evil. In the midst of this chaos, the Champions need...Scott Summers? Cyclops reunites with the Champions, all grown up! Marvel Super Heroes Adventure Game. 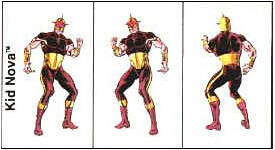 Super Heroes Game - Basic Set. 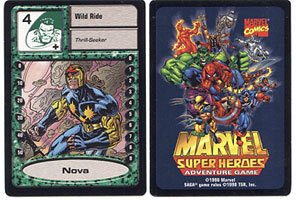 Left: 2005's Marvel Web of Spiderman Boosters set - Next 2 Cards: 2007's Marvel Team-Up set. 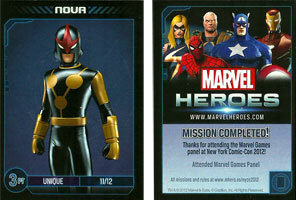 Comic Con for the Marvel Heroes Game.